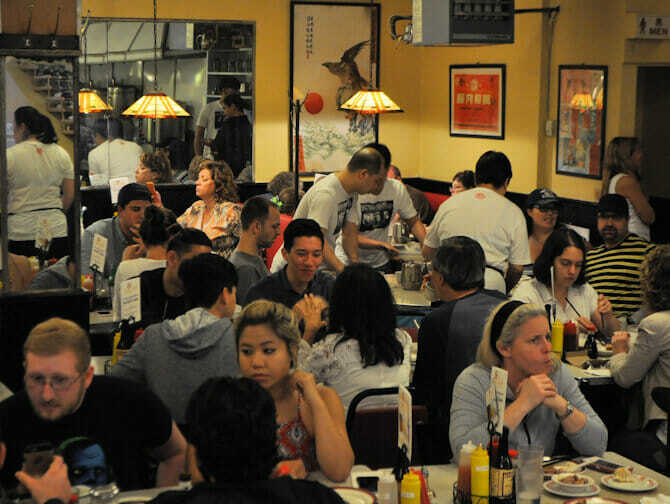 During the Chinatown and Little Italy Food Tour you’ll explore the two Manhattan neighbourhoods and enjoy local delicacies. Italian cannoli and mozzarella, Chinese dumplings and dim sum and many other specialties are on the menu. The guide will show you the places where local Italian and Chinese New Yorkers do their groceries. Start this walking tour on an empty stomach and enjoy the tasty food. After meeting the guide at Ferrera Bakery and Cafe in Little Italy (known for its Italian pastries),sit down and relax while the guide tells you more about the history and food culture of the neighbourhood. You’ll get the chance to taste their world-famous cannoli: a tube-shaped biscuit, filled with sweet ricotta. Did you know: bakers traditionally used a broomstick to form these pastries? 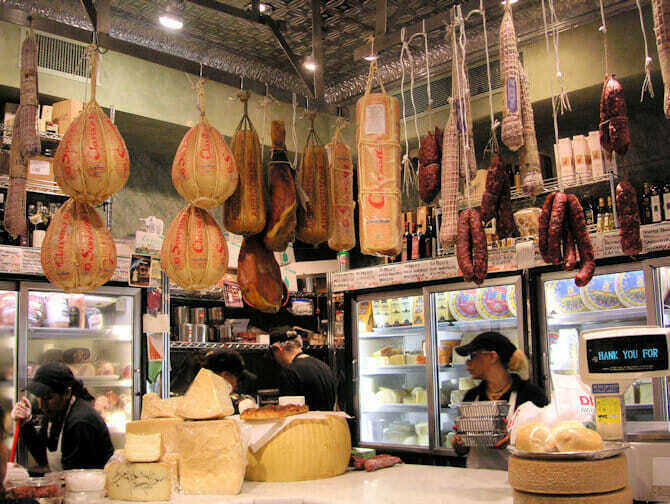 What’s a food tour through an Italian neighbourhood without cheese? After the introduction, the guide will take you to the oldest cheese shop in New York, where you’ll taste real Italian mozzarella. 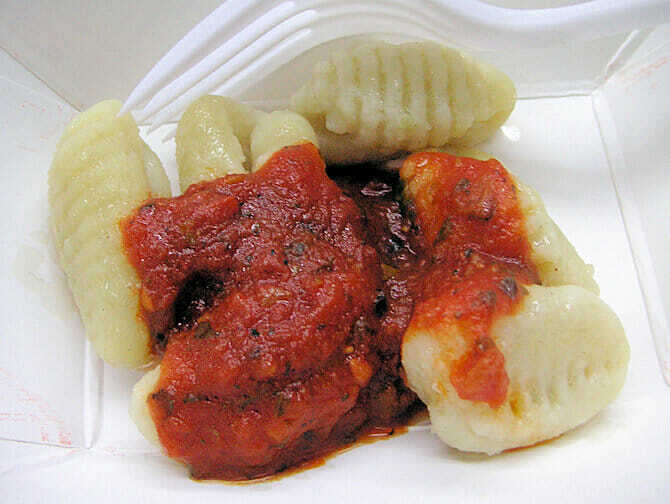 You then head next door, where you can try several special, home-made pasta dishes. In the kitchen, at the back of the store, you can see how they make the pasta and sauces. You’ll then walk to Di Palo’s Fine Foods, one of my favourite places! If you visit this shop on your own, you have to take a number and wait your turn. The employees will treat you like one of the family. At Di Palo’s you get to taste cheese and olives. It’s time to leave Little Italy and head to Chinatown. You’ll notice the change right away, when you hear Chinese people talking loudly on their phones. The first stop is a dim sum restaurant. 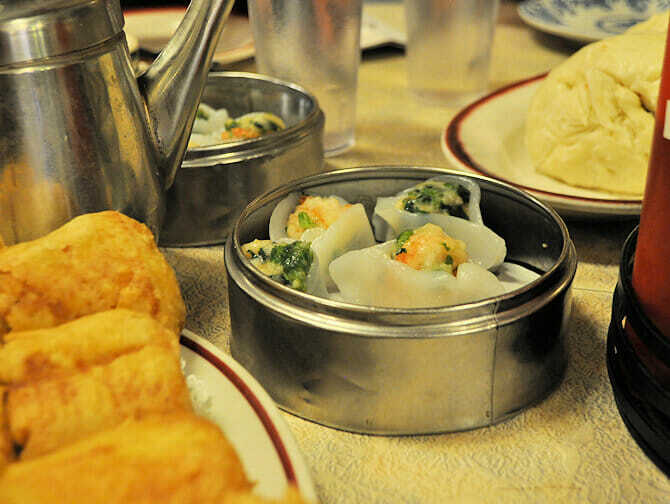 Here, you’ll enjoy a sit-down dim sum tasting, among locals who are having lunch. This is also a good place for a quick bathroom break. You’ll then head to a place that sells dumplings and where you’ll get the chance to taste this Chinese specialty. On the way there, the guide will tell you about the neighbourhood’s shocking history. If you want to enjoy more dumplings after the tour, you’ll be happy to know that this place sells 5 dumplings for $1,25! At the end of the tour, the guide will hand out sweet rice balls with sesame filling that he purchased at the last place you visited. Eric’s Tip: During this tour, you’ll eat a lot! So make sure you only have a light breakfast. You won’t have time to shop at the places you visit, but you can of course go back to your favourite shops and restaurants, once the tour has finished. At the end of the tour, the guide gives you a map of all the places you visited, so you can easily find them on your own. After purchasing, you will receive a voucher that you can print out and use as your ticket for this tour, or show as a mobile ticket on your phone. Note: When I went on this tour, we visited the shops and restaurants I mentioned above. Every tour is different though and you might visit other places than I did.